Many of the best agates ever found have come from Chihuahua, Mexico. Collectors are especially fond of the wide variety of multicolored fortification agates from Ojo Laguna. Some of the best of these Lagunas are illustrated in The Beauty of Banded Agates. The asking price for the best individual agates pictured in this book range into 6 figures. Another type of agate, the Apache flame agate was discovered in 1957 near Ejido El Apache. These agates have great, vibrant splashes of color and reminiscent of the bold brushwork of Vincent Van Gogh. They are not quite settled as are the Lagunas. They feel a little mad, but that is also part of their charm. The single most revered agate is the Hooded Owl and it is an Apache agate. Veils of pure yellows and reds form a perfect owl against a blue sky. Very few fine Apache agates are ever seen. Not many were found, they were mined long ago and the deposit seems to be mined out. Multicolored examples are especially rare and desirable. They are much harder to find than Lagunas which were mined for many years and will likely be exploited for decades to come. 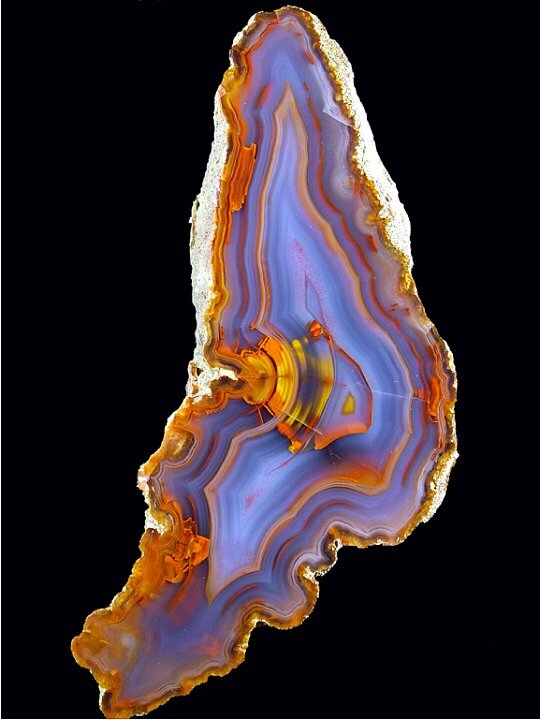 The agate illustrated below is called “The Apache Flame.” It was bought as rough in 1960 by June Culp Zeitner who is known for writing 9 books about minerals. This is an amazingly large agate for Mexico, as it is 10 inches tall and weighs 7 pounds. Very few fine Laguna agates reach 5 inches. Many other wonderful varieties of Mexican agate could be described, and Brad Cross has done a fine job of this in his The Agates of Northern Mexico.